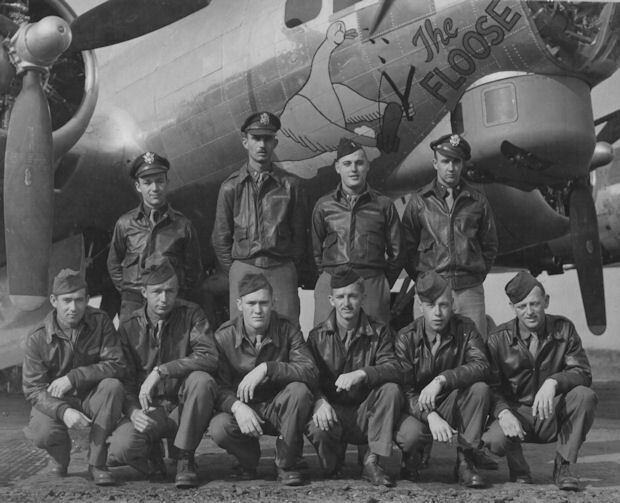 2Lt Alfred B. Clumpner (P)(KIA), S/Sgt Kenneth R. Pickell (E)(KIA, Sgt John W. Goetz (BTG)(KIA), Sgt James S. Baker (LWG)(KIA) and Sgt Elmer E. Simpson (TG)(POW) were on their first combat mission, Mission #159, 24 May 1944 to Berlin, Germany. 1Lt Joe B. Worthley (P)(KIA) and 2Lt Alfred B. Clumpner (CP). B-17 ditched in the North Sea. 2Lt John P. Connor (N) and Sgt Dwight W. Van Nemo (WG) flew no 303rd BG(H) combat missions. S/Sgt Erwin C. Zimmer flew on two combat missions (#151, 159). Lt Lowell L. Rickey (B)(EVD) - Flew on 19 missions. Evaded capture on mission #229, 15 Aug 1944 to Wiesbaden, Germany, in B-17G #42-97085 (358BS) VK-B, 1Lt R.P. Charnick, Pilot (MACR 8139). 2Lt Ernest A. Whittall (CP) flew on 34 combat missions. Last mission #233 on 27 Aug 1944.